A rockslide from some 100 metres above buried the houses belonging to Tirtha Raj Bohara, a member of the Jajarkot chapter of the Federation of Nepali Journalists, and Jit Bahadur Sunar at around 7:30am. According to the District Police Office (DPO), Bohara’s daughter Najita (5), Sital Luhar (25) and her three daughters Bhagawati (9), Ranjana (6) and Manisha (3) were buried to death. Sital, a permanent resident of Bheri Municipality-6, was a tenant at Bohara’s house. Narendra Pariyar (12) of Kushe Rural Municipality-6, Nabin Pariyar (10) of Kushe-6, Gobinda Pariyar (12) and his brother Dasharath Pariyar (5) of Nalgadh Municipality-3 died in the calamity. Two of the children had been staying at a rented room in Sunar’s house while the two others stayed in a neighbouring house. Other family members and people survived as they had gone outside when the incident happened. Lal Bahadur Luhar, the bereaved husband of Sital, was rescued alive after one-and-a-half hours. Lal Bahadur, who sustained injuries in the waist and arms, is being treated at Jajarkot District Hospital. “The children were studying in a room while Sital was preparing the meal. I was also helping her in the kitchen,” Lal Bahadur told the Post at the hospital. “Suddenly we heard a big bang and our house was buried in no time. I know nothing since.” The daily wage worker also lost three daughters in the disaster. Local residents expressed their ire at security personnel for their late response saying that some victims could have been saved had they reached the site on time. Om Prakash Singh Rathour, a local, said personnel from the Nepal Army and the Nepal Police reached the site 90 minutes after the incident even as they were informed about it within five minutes. A police post is just about 200 metres from the site while the DPO a kilometre away. Rescuers took nearly eight hours to retrieve all the bodies. Chief District Officer Krishna Prasad Khatiwada said help was delayed by incessant rains and continuous mudslide. The CDO said 17 houses in the area face high risk of landslide. Khalanga Bazaar has no access to the transport network as multiple landslides have obstructed roads linking the district headquarters. People’s movement and supply of essential goods has been affected by the transportation breakdown. Khalanga also faces a high risk of landslide due to deforestation, improper drainage and buildings lacking basic requirements. 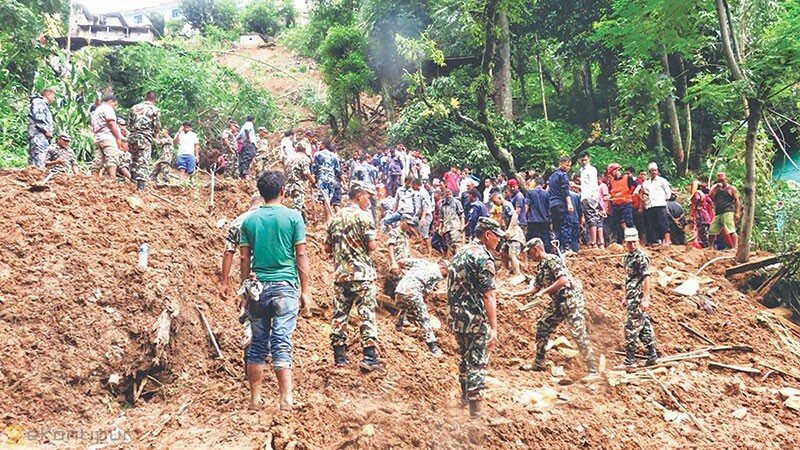 A landslide triggered by heavy rains at Khanigaun of Dharche Rural Municipality-7 in Gorkha on Saturday night has put a nearby settlement in peril. Seventy-two houses face the landslide risk after large cracks appeared in the settlement after the landslide. “Eleven families left home soon after the incident. Other houses are also at risk,” said Sushil Gurung, a local. The displaced are taking shelter in animal sheds.